Thief seems to have learned that a master thief carries only the most necessary tools - and quick time events aren't necessary. 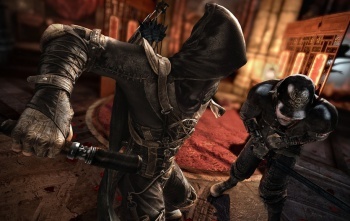 Eidos Montreal took a few liberties with its reboot of the Thief series of stealth games. One might say they were modernizing the franchise, if one were the developer's PR manager, but fans have been doubting that these "features" would enrich the stealth experience at all. Last month the developers decided to get rid of the experience system (which would have encouraged combat over stealth), and now there's another counterintuitive mechanic on the chopping block: quick time events. In a Q&A session on Eidos Montreal's community site, one fan asked how the developers planned to implement quick time events in a way that didn't break immersion. "Easy," answered Eidos Montreal's Valerie Bourdeau, "we're not implementing them. To begin with, there were very few instances of QTEs in the game; in fact there was only one in that whole hour-long E3 demo. However, given the strong reactions it evoked in the press and the community, it was an easy decision to do away with them entirely. So we're not doing it. No quick time." This is second mechanic the developers have eliminated in as many months, and though there isn't much time to meddle before Thief's February release, I don't think anyone will miss the QTEs. Though if you're truly heartbroken, feel free to press random buttons during cutscenes - it'll achieve roughly the same effect.